This page contains affiliate links. Read Full Disclosure Welcome! I hope you enjoy these FREE activities that are geared for 3-5 year olds. 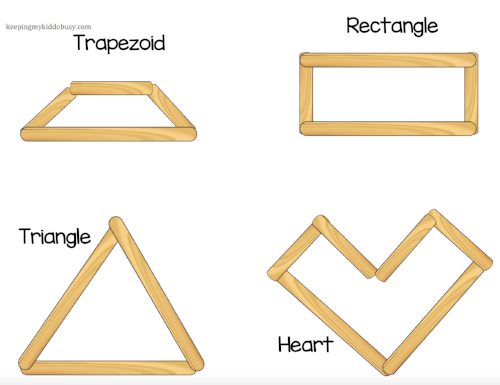 This is an easy way to teach children how to write their letters with correct directionality. Often times kids simply don't know where to place their pencil/marker to start each letter and how to trace each letter. We say, "Start at the Star!" I also use similar wording as the handwriting program Handwriting without Tears (my favorite compete program to teach handwriting!) This free printable I made is a great place to start. I recommend starting with one letter a day so your child masters exactly how to write each letter using "big lines, little lines, big curves and little curves." Building confidence is an awesome first step to successfully teaching handwriting. Just print and laminate (optional) and you've got an easy way to teach your child to write their letters. If you're a teacher - make a class set! My children love any activity with magnets. This is a fun one to practice both letter recognition and letter sounds. I print this double sided and laminate for durability (optional). Simply place on a cookie sheet and give them magnets to practice both sides. With activities like this, I use the "I do, We do, You do" approach. I do it first and model what is expected, then we do it together so if they have questions you're right there and only after that it becomes an independent activity. These magnets are strong (unlike many magnets that fall right off) plus they come with CAPITAL and lowercase and even numbers too (I have mats for numbers and counting too further down in this post!) The carrying case the magnets come in are easier than a tub. Practice recognizing and matching the entire capital alphabet with these adorable cut/paste sheets. You can do all at one time, or use one sheet each day. A great way to practice fine motor skills, following directions, and alphabet names and sounds. 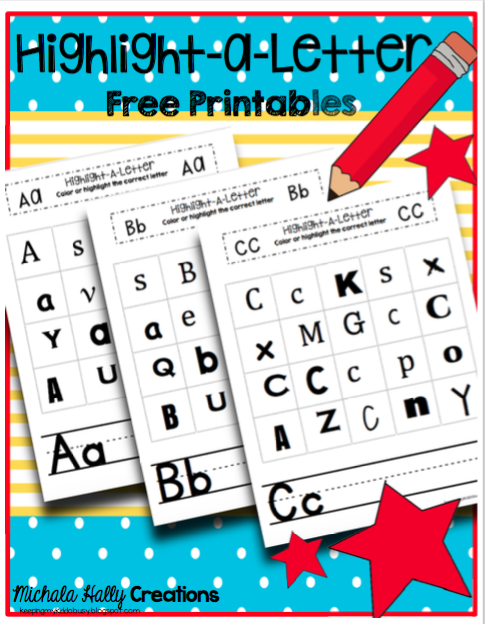 Use this free Highlight a Letter pack to teach letter recognition. 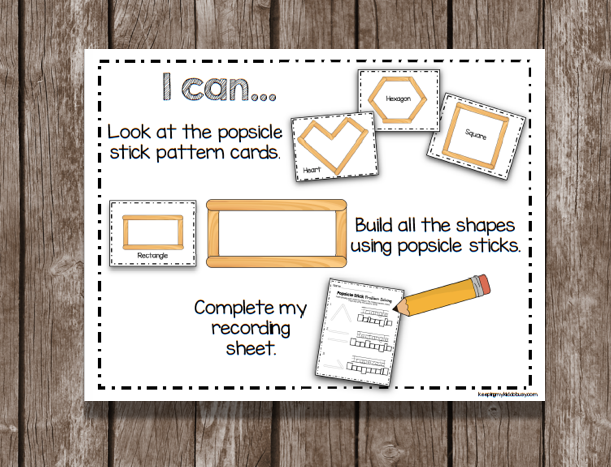 I print this pack and use the worksheets as reinforcement and extra practice. This is the perfect activity for fast finishers or on substitute days. Each page focuses on a different letter. My kids love to use highlighters or even daubers to switch it up! The highlighted blue area shows you where you can type! The blue will not show up when you print. Simply open the file in Adobe 11 Reader and type your child's name! This can be edited as many times as you would like - so if you're a classroom teacher you can use this one worksheet for your entire class. This editable name worksheet is FREE in my Exclusive FREEBIE LIBRARY for email subscribers! Simply sign up HERE and you can access this FREEBIE, plus so much more right away. You can print these pages, laminate for durability and leave as a mat or cut apart. 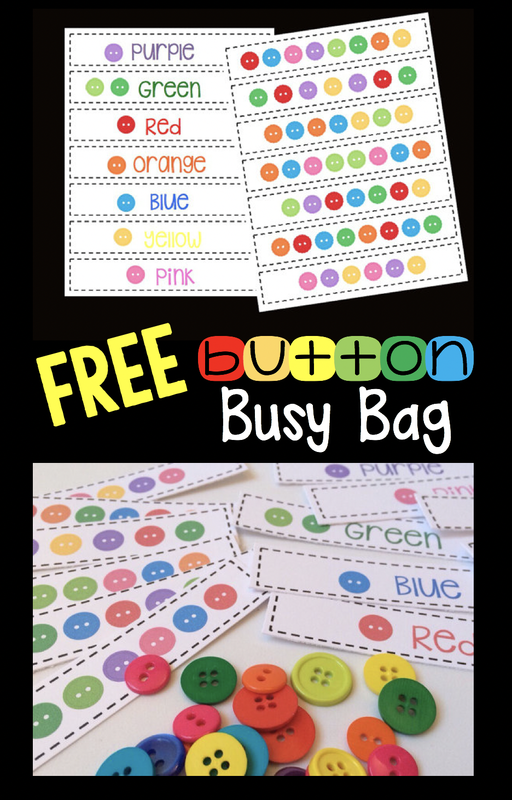 Grab a pack of buttons and this activity is ready to go. There is something about buttons that kiddos just love playing with! 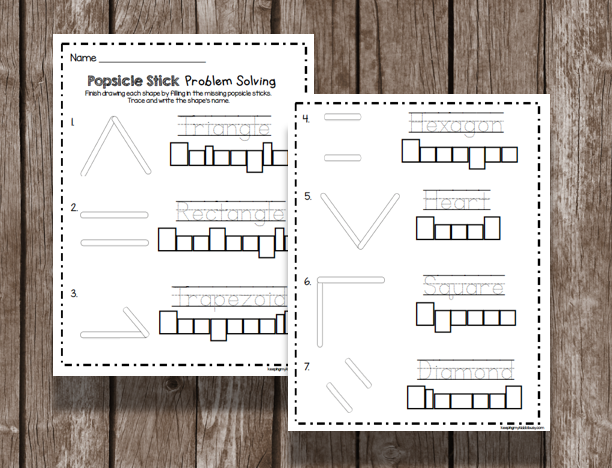 Print these adorable popsicle stick pattern puzzles for an an busy bag or center activity. This activity works on so many skills including patterns, spatial reasoning, problem solving, following directions and more! I print, laminate, cut apart and put these in a basket with a handful of colorful popsicle sticks. Super easy and the kids love completing them. This is a super fun busy bag for little hands to work with. It requires them to work on hand-eye coordination, left to right tracking, patterns, problem solving and more. This works great as a classroom center for preschool and kindergarten as well. There is something about these counting bears that kids just love to play with them. From pretend play, to patterns, sorting, counting and more... these bears are a must have for every classroom or busy bag collection. and even fill up their baskets with fruit to match the pattern cards! This is a fun activity for kiddos to practice number recognition and 1:1 correspondence. Lots of kids will say, "I can count to 10!" But they cannot actually count 10 objects. 1:1 correspondence is trickier than it looks for many children. Print and use these adorable train cards to recognize number and practice "loading" the trains with the correct number of "rocks." You can use mini pom poms, rocks, beads, etc. Sometimes you just need quick, easy activities that you can print and go! To go along with my magnetic alphabet mats, I also have number and counting mats too. 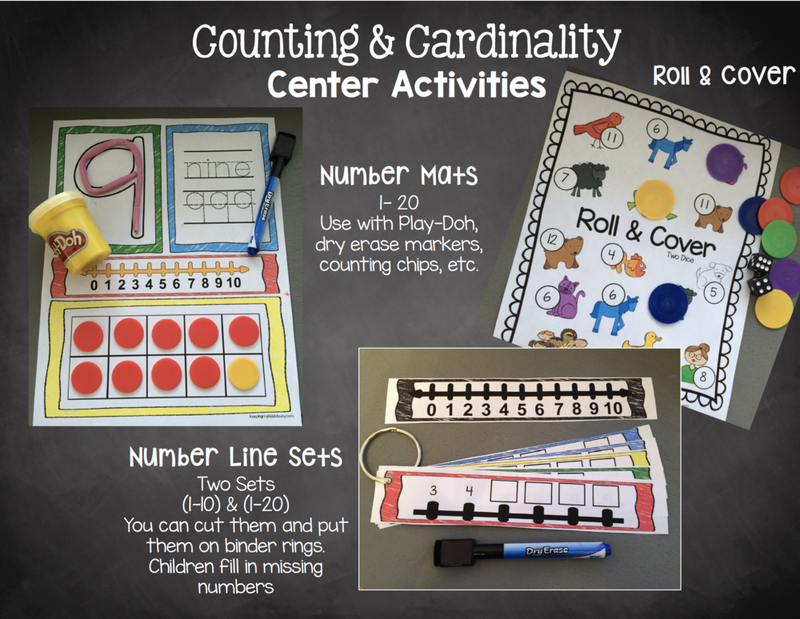 Print and use with cookie sheets and magnets - one practices number recognition on a train and the other targets counting fruit in baskets. 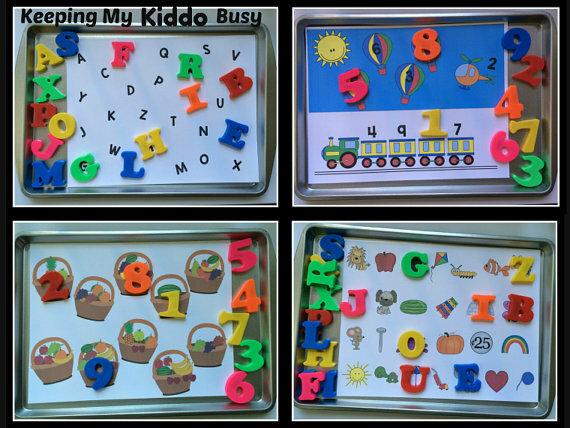 The same bag of alphabet letters and numbers magnets found HERE can be used with this activity! I like to laminate the mats for durability, but this is optional. We love using Unifix Cubes! They are so versatile and can be used for so many things. I especially like how they are easy for little hands to work with. They snap together and break apart easily. 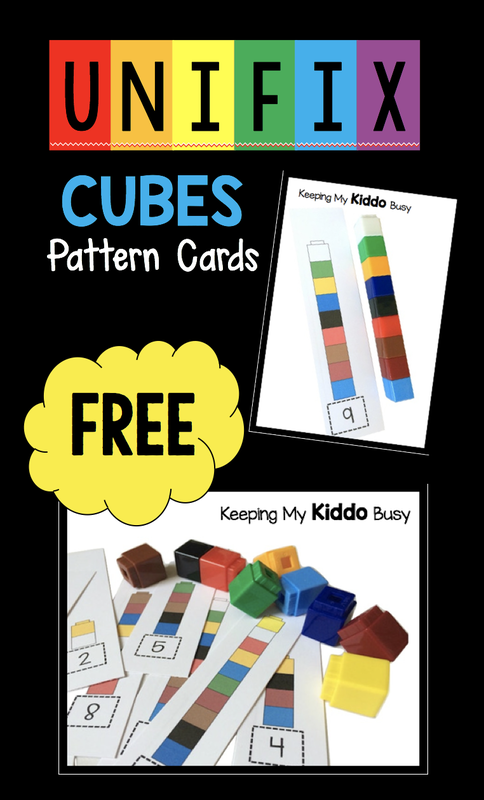 These pattern cards work on 1:1 correspondence, counting, number recognition, following patterns, fine motor skills, and more! Simply print these cards, laminate (optional) and cut the strips apart. Grab some Unifix Cubes and you have a perfect Counting and Cardinality center or busy bag! We love to use long and short popsicle sticks to practice building shapes. It is so much fun to watch kiddos grow in their understanding and problem solving skills after practicing with this busy bag.I used this as a center in my kindergarten classroom, but now I use it as a busy bag with my 3 and 5 year old at home.Children follow the pattern cards using their popsicle sticks, and then can fill out a recording sheet (accountability during center time! )There is even an I Can directions poster included to help children be independent. 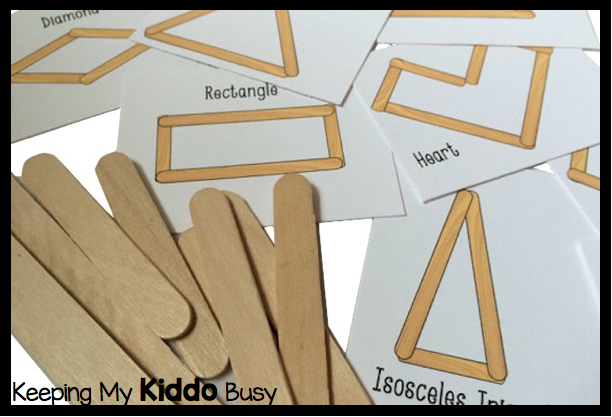 You will need mini popsicle sticks and regular popsicle sticks to complete this activity.